Landaas & Company newsletter May edition now available. The Commerce Department said construction spending rose 0.3% in March, which was lower than analysts expected. Spending on residential construction increased 1.6%, led by multi-family units. Transportation and manufacturing led non-residential spending. Year-to-year, construction spending increased 8%, with residential expenditures rising 7.8%. The ISM Manufacturing Index suggested the industry continued expanding for the second month in a row in April following five months of contraction. Growth in new orders and production slowed. Exports expanded for the second consecutive month, rising to the highest reading since December 2014. Consumer spending, which drives more than two thirds of the U.S. economy, got a green flag from a rise in motor vehicle sales in April. Dealers sold at an annual pace of 17.4 million cars and trucks last month, according to Autodata Corp. That was a 4.8% increase from the March rate, the first gain in three months. The U.S. trade deficit narrowed more than expected in March, by 13.8%, to $40.4 billion, according to the Bureau of Economic Analysis. 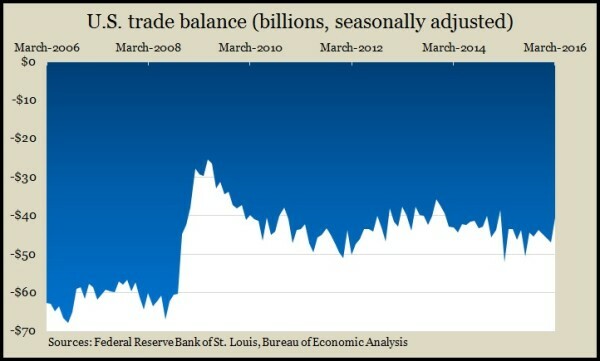 Exports declined by 0.9%, despite the benefits of a weaker U.S. dollar, which makes American goods less expensive abroad. Imports fell by 3.6%, suggesting U.S. consumers are curtailing their appetite for foreign-made items. The annual pace of worker productivity fell 1% in the first quarter, although not as much as analysts expected. The Bureau of Labor Statistics reported a 0.4% gain in output but a 1.5% rise in hours worked. Year-to-year, productivity remained at less than 1%, suggesting companies may need to invest more in the efficiency of their operations and hire more workers. An approximation for business investments advanced in March, for the second month in a row, according to a Commerce Department report on factory orders. Helped by military requests, orders overall rose 1.1% from February, even though automotive demand declined. Non-manufacturing industries, which directly account for about 90% of the U.S. economy, expanded for the 75th month in a row in April, according to the Institute for Supply Management. Non-manufacturing purchase managers expressed optimism in the business climate as well as the direction of the economy. The moving four-week average for initial unemployment claims rose for the first time in four weeks after hitting its lowest mark since December 1973. Labor Department data showed jobless claims remaining 28% below the historical average, suggesting continued reluctance to let workers go. U.S. employers added fewer jobs than expected, at the lowest pace in six months, the Bureau of Labor Statistics reported. The closely watched employment report showed payrolls expanding by 160,000 jobs, vs. a three-month average of 200,000 jobs per month and a 12-month pace of 232,000. Mining employment suffered the most, having lost 191,000 jobs since peaking in 2014. Most other indicators in the report remained relatively steady. Wage increases continued at a tepid pace of 2.5%. The unemployment rate stayed at 5%.